The suicide booth is a phone booth like machine standing on most corners in New New York. 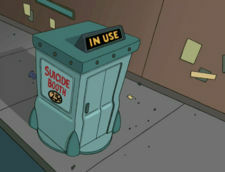 The suicide booth is used for a quick, efficient way of committing suicide. While some suicide booths are purely mechanical, others seem to be robots, for example Lynn. The suicide booths have been in use at least since 2008, when the Stop-N-Drop brand of suicide booths was introduced. The cost of suicide is 25¢, which probably has not changed in a thousand years. The booth is controlled by a voice recognition feature, however it is apparently still in large development, often mistaking phrases such as "no" for "yes". The booth allows for two primary forms of killing, "quick and painless", or "slow and horrible", but it is also possible to describe your own method to the machine. The machine will even offer special offers for its customers, such as getting your eyes scooped out with a melon baller for an additional 10 dollars. The machine uses various items to kill you in the most horrible fashion, afterwards people's bodies can be shipped to their loved ones for an additional fee, for example by the company DeadEx. If the normal "quick and painless" mode is selected, the machine apparently disintegrates its customers, as evidenced by a muted zapping sound and a flash of light that can be seen from outside the booth. When the next user enters, there are no visible traces of the previous occupant. The machine also dispenses a receipt, that is generally never collected by the user. Suicide booths and twentieth-century phone booths are often confused, such as at Past-O-Rama, where Bender is so bored that he wants to use a "suicide booth" he finds, only to be told it is in fact a phone booth. Bender again mistakes a phone booth for a suicide booth when he is teleported back in time, and, after failing to kill Fry, attempts to use it for suicide. Ironically; in "Lethal Inspection" after learning that he is mortal, Bender enters a booth, Hermes thinks it is a suicide booth, but it is actually a phone booth, a "new invention". Hermes then proceeds to toss his cell phone in the trash. Some, if not all, suicide booths also seem to be conscious robots. The only one seen to have its own emotions and choices is Lynn, who murdered Bender inside her in 3011 (6ACV19). The suicide booth can easily be tricked into dispensing free suicide if the user inserts a coin tied to a string, and then retrieves the coin before selecting the preferred killing method. It is also possible for two users to cram inside the booth, thus making the machine administer two suicides for the price of one. However, given that these design flaws have not been rectified in the past thousand years that suicide booths have been in use, such exploitation seems to be a marginal problem. Fry waiting to use a Suicide Booth, thinking it's a phone booth (1ACV01). Lynn, the only known conscious suicide booth (6ACV19). The voice recognition feature of the Suicide Booth most probably makes fun of similar modern Intelligent Network automated systems and their inferior quality. Moore Action Collectibles released a Bender toy, featuring a suicide booth, in 2001. In the pilot, the only options for "Mode of Death" were "Quick and Painless" or "Slow and Horrible". Yet in two movies, Bender selects "electrocution, side order of poison" and "clumsy bludgeoning". The name "Stop-N-Drop" is a play on the name "Stop & Shop". Voice: You are now dead. Thank you for using Stop-N-Drop, America's favorite suicide booth since 2008. Voice: You are now dead. Please take your receipt. This page was last edited on 4 June 2016, at 08:07.